I have read about the upright, "bush" type clematis before, but have never actually seen them in anyone's garden. The minute I saw this one at the show, I knew I had to have it. You really have to see it in person to appreciate the color...a lovely, dusky purple...without the maroon undertones you usually get in purple foliage. It's also not the dark black-purple you see...it's more on the blue side with a velvety effect. It's starting to green up (starting at the bottom) with the new growth still coming out purple. It's setting flower buds now and will probably bloom in few weeks, after which, depending on what it looks like, I may cut it down to a foot or so and let it re-sprout with new, purple foliage. 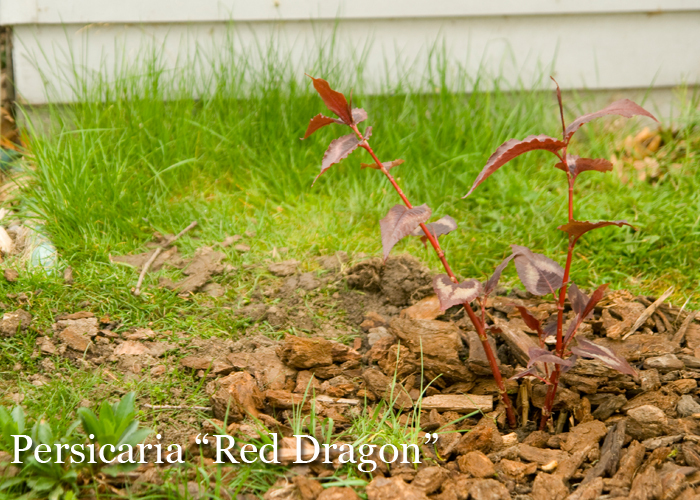 Since it is the plants first year, though, I may just let it grow and get more established. 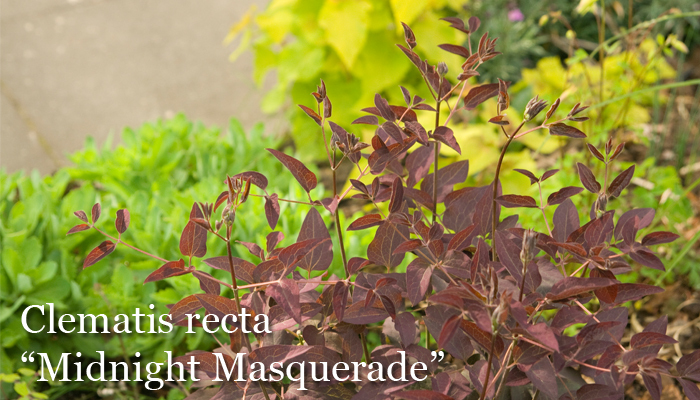 Ever since discovering Piet Oudolf and his amazing perspective on planting and gardening, I have been looking for a persicaria to try out. Oudolf often uses them in masses in his gardens and the effect is just stunning. They have a loose, blousy effect that seems so perfectly cottagey and, well, European! I saw this variety on another website a year or so ago, and upon seeing it, snatched it up immediately. I love the foliage so much, I don't care if it ever blooms...but I'm still glad it does! 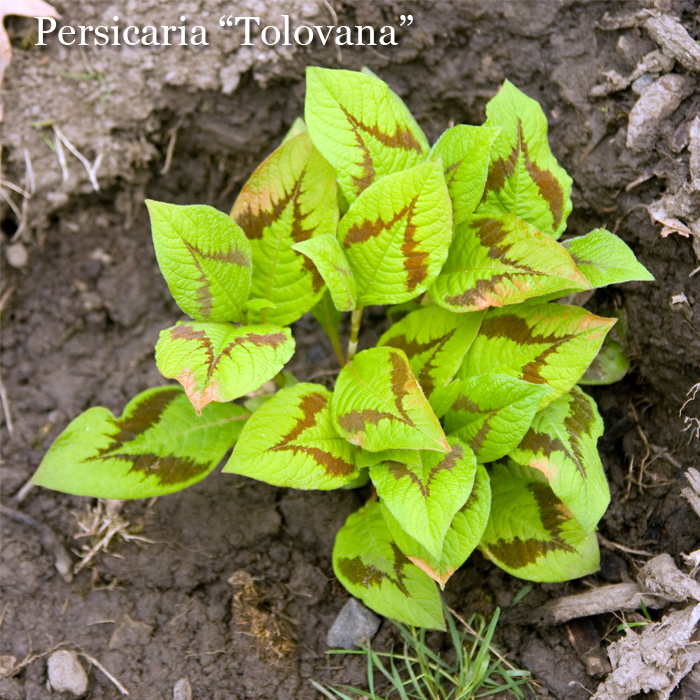 At last, a non-running Persicaria with chevron patterned leaves in red-purple, silver and green with distinct red midribs. A cloud of white flowers in spring. The leaf color holds up better in cooler areas. Spring bloom 37 in. x 48 in. Ok...so this plant has never impressed me until last year. Upon moving to Brooklyn, I noticed on of our neighbors had this plant growing in her yard and it was truly a sight to behold...at least 5' tall and as wide...it was the move sumptous burgundy color with those complimentary silver chevrons. I immediately knew I wanted one! I hope she agrees that imitation is the sincerest form of flattery!